I have been to Singapore a number of times for business. However, it is a wonderful place to visit as a tourist too, since it provides the visitor with an introduction to many Asian cultures. It’s also one of the most efficient and cleanest cities in the world. 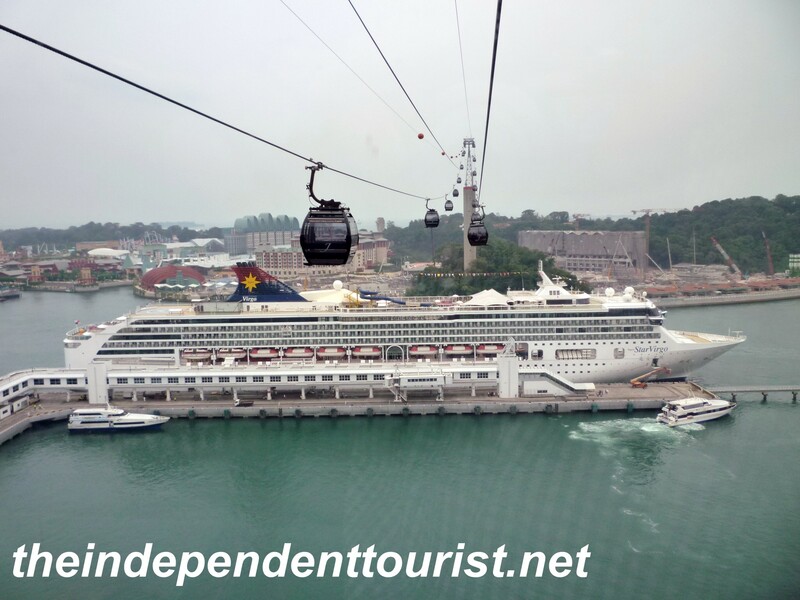 More recently, it has become a major cruise ship destination. Looking northeast along the Singapore River from the financial district. Great restaurants line this river. Singapore is home to about 4.5 million people on an island which is 247 square miles (plus some other very small islands), just a little smaller than New York City. Ethnic Chinese make up the majority of the population, followed by Malay, Indian and many other ethnic groups. There are about 100,000 expatriates working in the country too, since it is a commercial, shipping and financial hub in Asia, with a very strategic location. Singapore has one of the strongest economies in the world. Singapore gained its independence 1965 from Malaysia, having been a colony of Great Britain since the early 1800’s, except for a period of Japanese occupation during WWII and briefly belonging to Malaysia from 1963-1965. One caution—Singapore is very densely populated, and the constant crowds (try going to a shopping mall on the weekend!) might be a shock for a person used to lots of open space. Also, Singapore has become quite expensive, partially due to the strong Singapore dollar compared to the US dollar. The current exchange rate is about 1.3 Sing dollars to 1 US dollar. Housing and hotels are very expensive, and is on par with the most expensive cities across the globe. 1. Changi Airport.The first impression of Singapore comes at the Changi International airport, an example of extreme efficiency and cleanliness. The airport has about every amenity one can think of, and is very easy to get in and out of quickly. Located on the eastern end of the island, it’s only about a 15-20 minute drive along the expressway to the heart of the city. If you are lucky enough to fly on Singapore Airlines, count your blessings—it’s one of the world’s most admired airlines. The planes are spotless and the flight attendants are lovely, gracious and attentive. If only our US airline counterparts could learn from them! 2. Language. Since Singapore was a British colony, English is the official business language and spoken by most of the population. The accent is sometimes a little difficult to understand, but usually not a problem. The Singapore government also requires that the locals learn their ethnic mother tongue as well, a great way to keep traditions and culture alive in this diverse country. 3. Marina Bay.This is an area on the south side of Singapore, near the heart of the business district, with new restaurants, hotels, and office buildings. You can have a drink in the many restaurant open air lounges and enjoy the marvelous view. The Marina Bay Sands Hotel (part of the “Sands” hotel family) is gorgeous and yes, has a huge casino. If you plan on gambling, bring your passport, otherwise you will not be let in. Singaporeans are required to pay a fee (about $100 US) to gamble, I guess to prove they have the resources and to discourage gambling among the local population. Gambling is fairly new to Singapore. Most of the high rollers are from mainland China. There is a roof top lounge and pool area, but visitors are limited to specific days and times to not inconvenience the hotel guests, and the cost to ascend to the roof top is about $20 US. Take a boat ride inside the shopping mall at Marina Bay Sands Hotel. The three towers of the Marina Bay Sands Hotel (with the new Art Science Museum on the left). 4. Sentosa Island. Sentosa is Singapore’s “weekend getaway” spot right south of the main island. I first visited Sentosa in the mid 1990’s, and at that time there was a golf resort, a few parks, some beaches and restaurants. Now, in 2011, it has totally changed. Wow. It wasn’t recognizable when I visited recently. New hotels (with more being built), shopping and attractions like Universal Studios have totally transformed this little island. Even still, it’s a great place to visit, and just a tram ride or taxi ride away from the HarbourFront shopping center. Casinos, resorts, zip line rides, bike paths, beaches and indoor skydiving are a few of the attractions in this happening place. Also, there are nice views of the Singapore skyline from Sentosa. It costs about $20 US to take the tram both ways (from HabourFront, Harbour Tower 2). 5. Fort Siloso (on Sentosa). With my interest in history, I love going to places like Fort Siloso. The Fort is at the west end of Sentosa, and feels “worlds away” from the modern Sentosa. It was built in the 1880’s and saw action in WWII. There are lots of exhibits, living quarters, bunkers and tunnels, showing what military life was like in the heat and humidity of the tropics before air conditioning. It overlooks the Keppel Habour entrance, and has a pleasant, park-like atmosphere. The Fort itself was built by the British and guarded Singapore during the early days of WWII until the British surrendered to the Japanese in 1942, which took place in a building at the Fort. Scene of the British surrender to the Japanese in 1942. The main square at Fort Siloso and some of the huge guns used at the Fort. 6. Chinatown.There is an area near the financial district known as Chinatown. Very good restaurants and interesting shops in this part of town. I love the artwork and intricate glass figure paintings available in the shops. I also like the colonial architecture which provides a feel for the “old” Singapore and contrasts with the super modern office towers nearby. Chinatown is within walking distance of the Amara hotel, where I usually stay. With skyrocketing land values, I wonder how long this area will remain. The Victorian architecture of Chinatown. The elaborate interior of the Buddha Tooth Relic Temple in Chinatown. The delicately hand painted glass items–incredible patience to paint in the interiors of these objects. A Hindu temple in Chinatown. The entrance tower to the Sri Mariamman Temple — the oldest Hindu Temple in Singapore (1827). Firewalking ceremonies are held every October or November. 7. Little India. Indians make up the 3rdlargest segment of the population. There is a “Little India” MRT (subway) stop, and if you like Indian food, this is a good place to visit. Many shops selling electronic goods, and some temples to be found in this quaint section of Singapore. The interior of The Jungle Tandoor restaurant–reminded me of the Rainforest Cafe (although the food here was good). 8. Lots of things to do near Singapore. Several Indonesian Islands are close by—see my post “Four Hours in Indonesia” for one example. Also, you can drive north and enter Malaysia (or take a day tour). The city of Johor Bahru is right across the Causeway from Singapore. Many years ago I took a day tour up the west coast of Malaysia through Johor Bahru and on to the city of Melaka, (aka Melacca) an interesting and historic port, formerly ruled by the Dutch. The Tenah Merah Ferry Terminal, where trips to Indonesia begin. 9. Easy to get around. Since the island is so small, a car is really worthless in Singapore. Owning a car is extremely expensive and driving is limited by the government in the downtown area by high tolls as a way to limit congestion. Parking is also very limited and good public transportation makes a car unnecessary for the visitor. There is a very efficient, spotless, air-conditioned subway system (called MRT), with many routes and convenient stops. Most MRT rides will cost 1-3 Sing Dollars. Note that you receive a plastic card (ticket) when you purchase a fare and are charged a deposit, which is refundable upon turning in the card. There are also lots of taxis and buses available. 10. It’s safe. Finally, Singapore may be one of the safest countries in the world. Even with 4.5 million people stacked on top of each other, serious crime is almost unheard of. This is certainly due to the governments’ strict rules and policies, but also due to a strong sense of community among the diverse population. Don’t even think of doing drugs in Singapore. They have a mandatory death penalty of possession or sale of illegal drugs. For many other crimes, the penalty will be lashes by caning, a penalty so painful that it’s a strong deterrent to crime. The casual tourist has nothing to fear – just enjoy yourself and the sights in this Asian paradise. Posted in Singapore and tagged Chinatown Singapore, Little India Singapore, Sentosa Island, Singapore Travel, Things to do in Singapore on January 10, 2012 by Paul Terry.